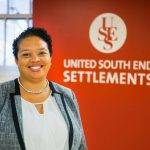 United South End Settlements has an important history and legacy of serving children and families over the last 126 years. I have the privilege and honor to serve as its President & CEO, and over the last two years we have developed a strategic and thoughtful plan to ensure our future. Like many non-profit organizations, we are in the midst of ensuring our financial health while having a deep impact on the children and families we work with. To get to financial sustainability, we will grow and deepen the impact of our programs, realign our real estate, and invest in the redevelopment of our space. When we started this work in 2016, we committed to an open and transparent process, and I am happy to share an update on our process. On Thursday, October 11th, we brought together over 75 people across our community to provide an update on our five-year strategic plan, Vision125, which puts us on a path to greater impact and financial sustainability. Gary Bailey, a South Ender, facilitated the meeting and helped guide the conversation in an inclusive manner. Board member and long-standing South End resident, Ken Kruckemeyer, and I presented on our real estate planning and organization’s accomplishments. I am grateful for our public officials and community members, as well as our USES families, staff, and Board members who attended the meeting. USES has renewed its mission, and in many ways has gotten back to our roots of supporting the whole family with our two-generation program model. Our plan calls for growth in our Early Childhood Education program by adding additional infant and toddler classrooms, renovations and improvements to our facilities at Camp Hale (which will serve 360 youth each summer), expansion of our job training and coaching programs to support more parents and caregivers, redevelopment of the Harriet Tubman House, and redeployment of our real estate assets. The ultimate goal of this plan it to ensure USES’s financial sustainability and continued impact for generations to come. The original Harriet Tubman House, founded in 1906, was located on Holyoke Street before it moved to the Columbus Ave location in 1976. We are committed to continuing the legacy of the Harriet Tubman House through a redevelopment of the building and creating a comprehensive and integrated campus of learning for children and families in one of Boston’s most diverse neighborhoods at our Rutland Street location. This plan is emblematic of our mission: to harness the power of our diverse community to disrupt the cycle of poverty for children and their families. USES is beginning the process to seek proposals for our property at 566 Columbus Avenue that have significant community or public benefit. We will carefully review all proposals and will continue to lead an open and transparent process. Please visit www.uses.org/vision125 for more information and updates on USES’s Vision125, or email vision125@uses.org with any questions, concerns, or to be added to our newsletter. You can also follow us on Facebook, Twitter, and Instagram.